Ahoy ladies… No, I am not out of town on some exciting adventure… I am sitting on my couch. 20 feet from my room and laptop. I have had one of the nastiest days on record today, and am consoling myself with a fine glass of Smoking Loon (the liquor store was out of my favorite Coppola, which was the icing on the cake to my terrible, horrible, no good, very bad day)… Just wanted to test out the Blackberry blogging capability before Mr. Wonderful gets home and I feed him a dinner gone terribly wrong… I’ll update soon with the weekend wedding update. In the meantime- would you please comment with something *wonderful* that happened to you this weekend or today? Big or small, I’d very much like to hear it to cheer myself up. Thanks! 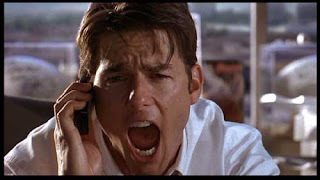 Ohhhh, Jerry Maguire… How I adore thee. Today’s going to be a big day, Dear Reader. Today I shall pull myself up by those proverbial Burberry bootstraps, and get back into the game. The wedding game. I’ve spent exactly 2 weeks on the job hunt now (more on that later), and have all but neglected the planning of our wedding. No more, my friends, no more. Today, our little shoebox will be Wedding Command Central. I will e-mail, call, build inspiration boards, write funny quips about my girlfriends for our wedding website… Basically, I’m going to show this wedding who’s boss. The first step on the agenda (after I run to the store for more coffee) is to finally pull all my wedding papers in order, and update my master budget spreadsheet. You heard me right gals, I need this wedding to Show. Me. The. Monaaaaaaaay! Liene from Blue Orchid Designs has a poll on her website here to see how the state of the economy has affected your grand wedding plans (if at all). won’t you stop by for a quick vote? I’m sure she’d appreciate it. Needless to say, being sans employment has definitely made us think about this wedding in a different light. The money I saved up for the honeymoon? Now a cost of living cushion in case the job search takes a few months. We may change up our bar strategy at the reception (something to the effect of signature cocktails plus beer and wine up until lunch is finished, THEN open bar for the remainder of the day?) I mean, I know a scotch on the rocks IS tempting compliment to your 2pm lunch salad and all, but maybe you could just wait until the dancing begins? We’ve also decided to cut down on he guest list, which is an exercise I am NOT looking forward to. I guess that I should be relieved that I have STILL yet to send out those *gorgeous* Save The Dates (so sorry, Laura Hooper! )… We’re in Save The Date stall mode because we put our wedding website URL on the back of the Save the Dates… And I have still yet to fill out the website! Sheesh. Have any of you brides-to-be had to make changes to your event, due to the change in the economy? That’s about all I can muster for one day, I think… Wish me luck! You NEED to read her top-notch ideas on the ultimate Election Party here! Thanks again Nina, you’re my go-to guru for all things fabulous! Impromptu Election Party – Ideas Needed! Mr. Wonderful is currently working away in Philly right now, manning the phones and hitting the pavement for the campaign. He should arrive back from his big “final push” trip sometime Tuesday evening, just in time to hunker down for a long night in front of the TV. I was thinking of preparing a nice little Election Day meal for his return home, but wanted to open up the floor to you for creative ideas. Are any of you having an election party this year? What will you be serving? What would you serve? All suggestions welcome! Fun, right!? I think this was one of the favorite Halloween costumes I’ve pulled off thus far. I received a lot of compliments, and overheard more than a few “She really looks like Sarah Palin!” comments. Sadly, this is the ONLY photo I have of the costume from the entire night. For some reason, I feel strange asking random people to take pictures of me… Since Mr. W was in Philly, I was without my trusty cameraman, and thus no more Palin pics to be found. The photo does it NO justice either, it looks 5 times nicer in person than it does in the photo. Can I just tell you that it is from Linens ‘n’ Things, of all places!? It’s one of their Bed-In-A-Bag sets, and comes with EVERYTHING shown. Pillows, comforter, the whole 9 yards. For under $100! I died of amazement. You can find it here (before they go out of business). So before the party, I spent the entire afternoon causing some serious hair havoc. I attempted to get the signature Palin ‘do about 4 times, but to no avail. Hairspray, teasing, volumizing mousse… I think my hiar hates me by now. I just couldn’t seem to tease my hair correctly for pouf in the right places, and looked more like a bad version of Amy Winehouse than our dear SP. Suddenly, as I was untangling a rubberband from the birdsnest on my head for the 5th time, I had a beehive revelation… Socks. Yes, you read that correctly. Socks. I remember reading somewhere that in the ’40s and ’50s, women would use these things called hair rats (such an unfortunate name!) to give their hair extra volume (bigger buns, victory rolls, etc.). The original rats were made of real hair, saved up from your hairbrush (G-A-G!). Women also used balled up nylon stockings to do the trick (much less gag-worthy), so I figured I’d give that route a try. K’s party was a real hit. Great cocktails, yummy appetizers, and even a rockin’ Halloween mixed CD. It was neat to finally meet K’s sisters and friends, and see a little bit more of where she came from. Another one of my fave old coworkers, L, was there as well, totally rocking a Ghotsbusters outfit. Pure awesomeness. I think my favorite costume of the night was a girl that came in sporting a pink tee shirt, pink shorts from American Apparel, pink cowboy boots, and a lower-case i on the front of her shirt – she was Pink Eye! Pure genius. After a few hours at K’s apartment, we decided to rally the troops and hit the town. The streets of Manhattan were total chaos, people in costumes everywhere! It was really fun. We hit a few different bars, but there just seemed to be something lacking in the scene (think we were all tired by this point in the night). I decided to break from the group and head home around 1:30am… BAD IDEA. Girls, it was absolutely impossible to get home last night! All the subway trains weren’t working at the stops I tried to get on at, and FORGET about getting a cab in the city on a night like this. I ended up walking (in 4″ knee-high Burberry boots, mind you) for over 2 hours!